Harrison Design renovates a historic house of the 1920s, preserving its character while updating hardworking rooms. In the 1920s, Long Island’s North Shore was a storied stretch, home to some of the wealthiest families in the country. Dubbed the “Gold Coast,” the area boasted over a thousand mansions built from the 1890s to the 1930s, even inspiring F. Scott Fitzgerald’s The Great Gatsby with its stunning architecture, beautiful views, and lavish parties. A century later, fewer than a third of those grand estates remain. So the owners of one such property, a 1928 French Norman-style house designed by the esteemed Gilded Age firm McKim, Mead & White, wanted to be sure to treat this piece of American history with care, while making it functional for their young family. “[The clients] view themselves as stewards of this historic property,” says William H. (Bill) Harrison, principal with Atlanta-based Harrison Design, which oversaw the project, noting that the mission was to ensure the home was functional for the needs of the client’s growing family, while preserving original characteristics and personality. “The renovation of a historic property requires a careful balance of the need for preservation with meeting the demands of the 21st century. Architects must respect the past, satisfy the present, and anticipate the future,” Harrison says. Initially designed for the daughter of a famous railroad baron, the 14-bedroom house on 5.3 acres hosted many social and political galas through the years—but had never had a significant renovation or update. 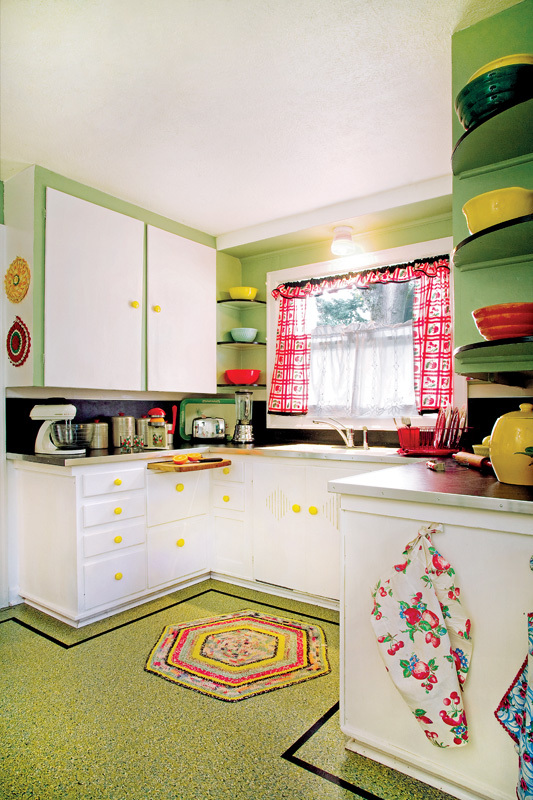 Back in the 1920s, people of means rarely spent time in their kitchens, which were designed for servants and tucked away from the formal living spaces. Thus, the 1928 kitchen was a narrow space facing the front, away from the property’s 391 feet of Long Island Sound waterfront. Designed for a vast staff, the mansion even had a staircase that skipped the second floor, connecting directly from servants’ quarters on the top level to the service area on the first floor. “The clients wanted a new kitchen to be central to the living space, with seating and counter area for breakfasts, informal family meals, and relaxing,” Harrison says. The designer introduced industrial globes into the lighting scheme in keeping with the minimalist design of the kitchen. The new owners also had no need for many of the features that Jazz Age occupants found indispensable. So the new open kitchen replaced the original pantry, servants’ hall, silver closet, and service stair, allowing space for two islands—one intended primarily for food preparation and another that invites family eating and gathering. To retain a connection with the history of the house, new overhead lighting fixtures, with oversized round globes and dark metal hardware, evoke the industrial design of the earlier era. 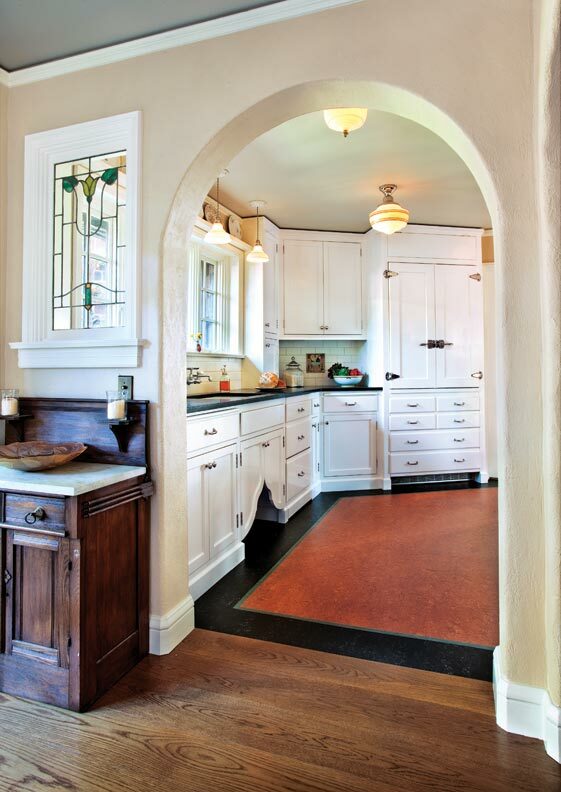 The custom hood echoes the look, accented with handmade glazed tile on the cooktop wall. A wall of cabinets surrounds the refrigerator; cabinets have an old-fashioned feel with classic design and hardware, lending a timeless air. The renovated home honors its past while embracing the present and the opportunities ahead, with a classic design to last for another century. To combine beauty with utility, different materials on the perimeter and island countertops are intended for different types of cooking, with marble for baking and a soapstone countertop with integrated double soapstone sink for food prep, nodding to the era when larger sinks were made from the countertop material. A new staircase in the kitchen connects to the second floor. “Having the secondary staircase terminate in the kitchen adds to the dynamism of the space, which is ideal for a family with children bounding up and down the stairs,” Harrison says. To enhance that role, a small playroom was created off the bottom of the staircase. The only downside to the new space was a lack of exterior walls or other source of natural light. 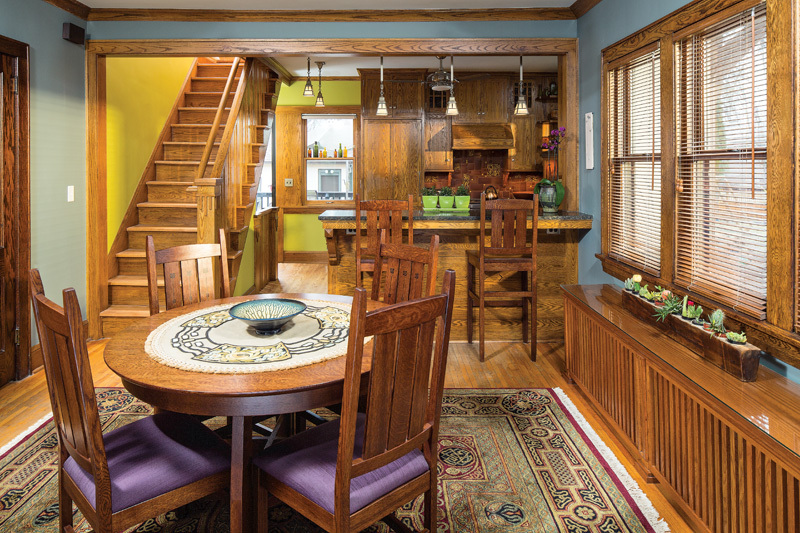 As a solution, the architects designed a new breakfast room, carved from a redundant service porch, scullery, exterior closet, and wood-and-coal bin. 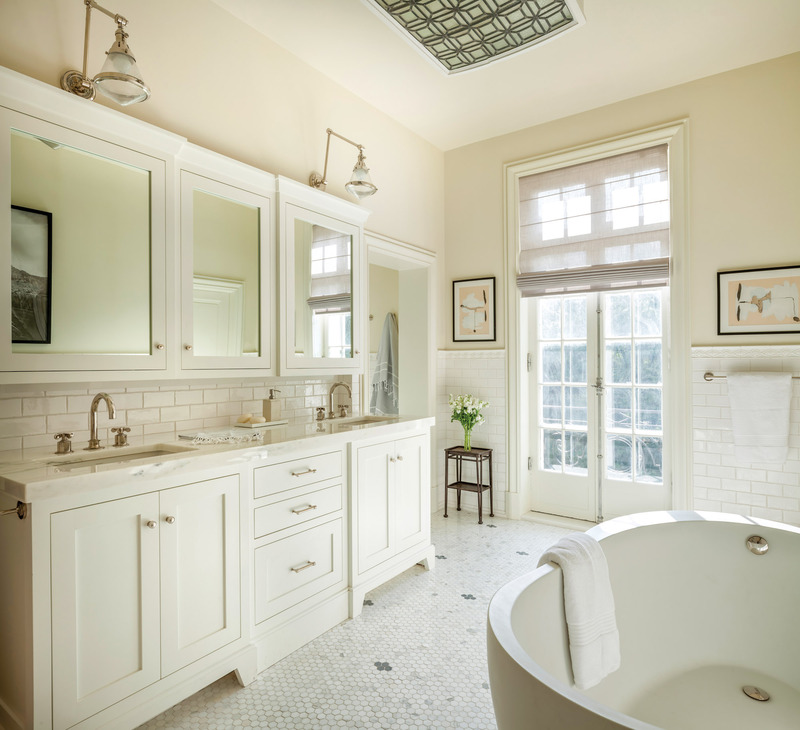 The use of subway tile in the master bath threads the present to the past. “Casement windows and a skylight [in the breakfast room] imbue a sense of openness and suffuse both rooms with sunlight,” Harrison says, noting that the new space opens out to a terrace with sea views. Light comes from every angle, with windows along two sides and a set of French doors, complete with sidelights and transoms. Above the dining table, an oversized skylight floods the room with sunlight. 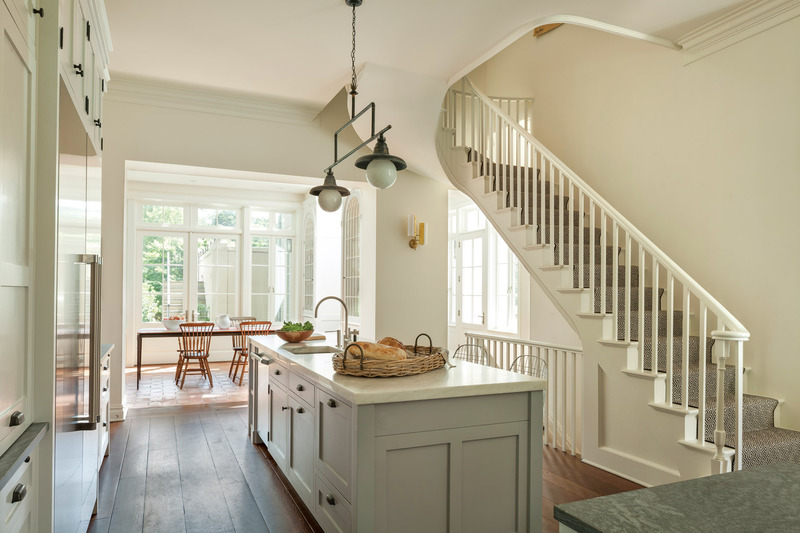 In addition, a clerestory window in the new stair hall allows additional light into the kitchen. On the second floor, the original master bathroom had been similarly cramped and unrenovated, and included an oddly positioned dressing room. “By reworking the footprint of the misused space, we created an en-suite layout with tub, walk-in shower, and a sizeable his/hers closet,” Harrison says, along with double vanities and a separate water-closet room. To preserve the character of the original design, the use of tile is historically precise, with tile wainscoting, textured tile caps, and a marble mosaic floor. Medicine cabinets are custom. A leaded-glass skylight originally in the main stair hall was restored and repurposed as a new ceiling fixture in the bath. 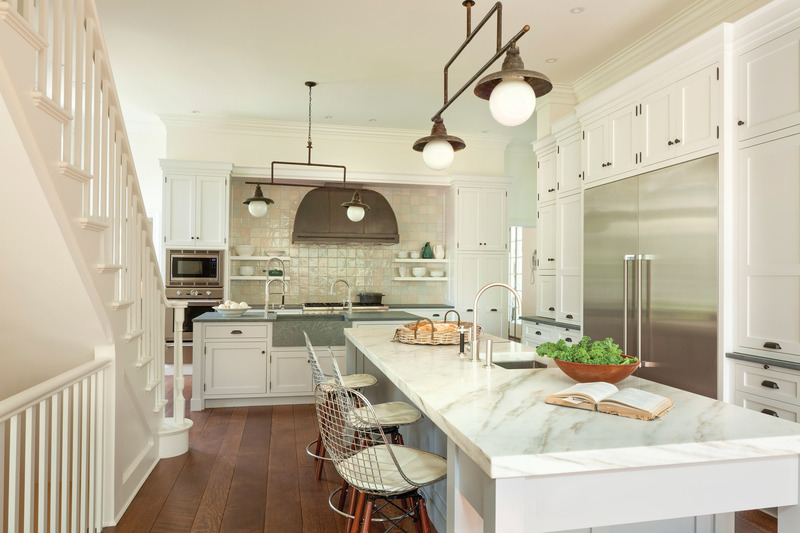 “The renovated home honors its past, while embracing the present and opportunities ahead,” Harrison says, with a classic design that perhaps will last for another century. This Tudor bungalow once felt small and cramped. After some deft changes, including a very modest kitchen bumpout, it lives large.